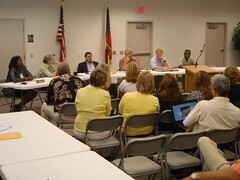 The Zoning Board of Appeals decided unanimously at its 6 December 2011 meeting to publish its agendas and minutes on the City of Valdosta's website. This item was not on the agenda, but members of such a board can make motions anyway. Member Gretchen Quarterman suggested it. Valdosta City Planner Matt Martin said they could do it no problem. Discussion ensued. They all agreed to post agends before their meetings, and to post minutes after they are approved (usually at the next meeting, a month later). Maybe other local boards and authorities will follow this example. ZBOA does not explicitly post its agendas, but the above appears to be the entire agenda for next week's meeting.